Impact Spotlight: Community arts projects are paving the way to a healthier, happier Beckley. Downtown Beckley, in Raleigh County, has long prided itself on its historic aesthetic appearance. In 2014, however, the town was in danger of losing its National Register of Historic Places designation by the State Historic Preservation Office due to demolition projects and alterations of historic properties. Preserving the historic integrity of the town, while also nurturing a welcoming atmosphere for new, creative ideas and projects, was imperative for community leaders looking to position Beckley as a business-friendly, vibrant destination for residents and visitors. WVSU’s Raleigh County extension agent, Christine Kinder, began working in collaboration with the Downtown Beckley Business Association (DBBA), a non-profit organization whose mission is to serve local businesses, property owners, the City of Beckley and the community in revitalization of the downtown district through efforts relating to public art, streetscape improvement, design and entrepreneurship. Under the auspices of the DBBA, Kinder has hosted a variety of successful community events, seminars, volunteer activities and public arts projects, as well as received grant funding to support new initiatives. Mini-grants totaling nearly $3,000 from Try This West Virginia (the first time the organization funded such projects) were used in public art initiatives along a rail trail running through downtown, aiming to promote the trail as a bike- and pedestrian-friendly offering. A ftness-themed mural, bike arch, signage, three bike racks and 15 bike art projects were installed along the trail. In addition, trellises were constructed and added to community garden sites. Truly a community effort, all art projects were created, painted and constructed with the assistance of local middle school students, a Boy Scout troop and a kids camp group. 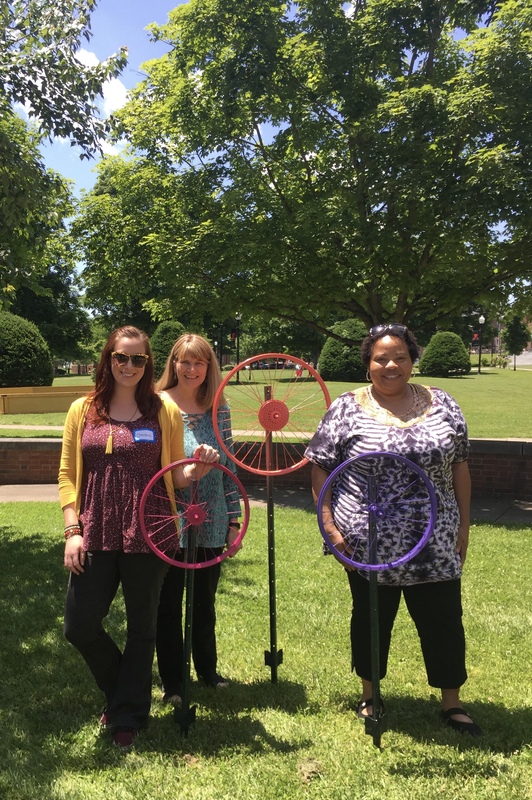 A local nonprofit organization donated used bike wheels for the art installation, while the City of Beckley Public Works department provided labor. Community development professionals from throughout the state have reached out to Kinder to learn how the projects were accomplished in hopes of facilitating their own such initiatives. Additional funding totaling $10,000 through personal donations, community foundation grants and matching dollars has been provided by community members hoping to see such work continue. This summer, the DBBA and partners are working to further enhance the rail trail with painted fitness paths for kids and nature inspired murals along a section of the trail designated for an “arts park”. The DBBA was awarded a second Try This WV mini grant to inspire a healthy lifestyle through beautification and public art. To learn about more ways WVSU Extension Service is working in your community, check out Impacting West Virginia.